Mouth ulcer is also known as an oral ulcer. It's an ulcer that occurs on the mucous membrane of the oral cavity or mucous membrane. In other words, a mouth ulcer is a sore or open lesion in the mouth. It is found as the red or white spot in the mouth and they are very painful blow. Mainly it is occurs due to lack of nutrition’s and vitamins; especially vitamin B12, C & iron, constipation also a main causes for it, mouth infections and excessive medication are also the reason behind it. The most common causes are rubbing from a sharp edge and canker sores or oral aphthae. Mouth ulcers may be very painful when you are eating food or talking with someone else. So, get ready for the treatment of this painful disease. Here are some natural remedies and herbs to completely cure from mouth ulcers. Harad is the best remedy to cure mouth ulcers or mouth sores. Take some little myrobalan (harad) and make the fine powder by grinding. Put this powder on your mouth ulcers three to four times in a day. With this remedy you’ll definitely relief and recover from mouth ulcers. You can also get rid from constipation. Honey works as antioxidant and it is a rich source of fructose, glucose, vitamins and minerals. Take a little bit of honey; gently rub it to mouth ulcers and blobbing out the saliva; which is made by the honey in the mouth. Basil leaves have the antibacterial properties; it works for healing the sores of mouth. Chewing 5-6 basil leaves with water thrice in a day to get rid of mouth ulcers. Lemon works as antioxidant and it is a rich source of vitamin C. Take a glass of lukewarm water and therein squeeze a lemon with little bit of salt; then mix it well. Thereafter rinses your mouth with this water. Take a pinch of turmeric powder and therein add some honey to make the fine paste; now, gently rub this paste on mouth blisters to get a quick relief. The ice compression method works as effective pain relief, take a small ice cube and gently rub it on mouth sores, try this procedure at least for 5 minutes to reduce pain. It is a best lubricant known for its moisturizing properties. Take a few of glycerin; gently rub it to mouth ulcers and blobbing out the saliva; which is made by the honey in the mouth. You can also add it with turmeric powder and apply on canker sores to get relief. Add half teaspoon salt in a glass of lukewarm water and mix it properly. Now, rinse (as gargle) your mouth with this water and spit out. You also can add some lemon juice into this water; this is also an effective mixture for mouth blisters. 1. Take regular treatment for constipation, It is the main reason for mouth ulcers. 2. Don't eat peppers and spices. 3. Try to fewer intakes of tea and coffee. 4. Avoid the use of addictive things such as alcohol, tobacco and smoking. 5. Keep fewer intakes of fried, hard, oily and fast foods. 1. Eat more green leafy vegetables, red tomato, yogurt, milk, fruits and vitamins supplements. 2. Drink 8 to 10 glass of water in a day to stay hydrate. 3. Keep clean your mouth by brush or mouth cleaner to prevent from infections. 4. 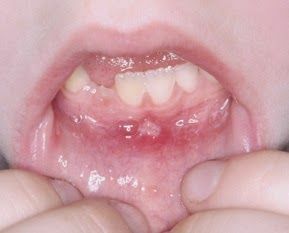 Do not rub these canker sores, it may spread fast.